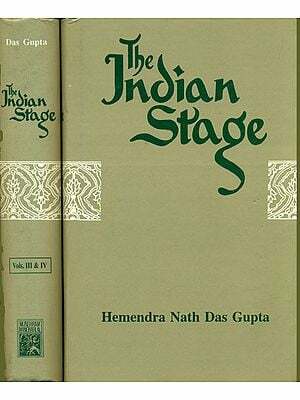 This book explores the presence and contribution of women to the recorded history of Indian theatre. It provides a platform to raise, discuss and debate issues, aesthetics and techniques connected with the Indian theatre in the backdrop of political, social and moral values of women in theatre. An attempt to fill up the vacuum of scholarly literature on the role of women in theatre, this book expects to create enough academic value and interest. Its content unearths the dynamics of gender in the history of theatre. It extensively deals with the theoretical and practical aspects of women's theatre. This anthology also addresses the various social issues associated with gender inequality through essays, play-texts and interviews. 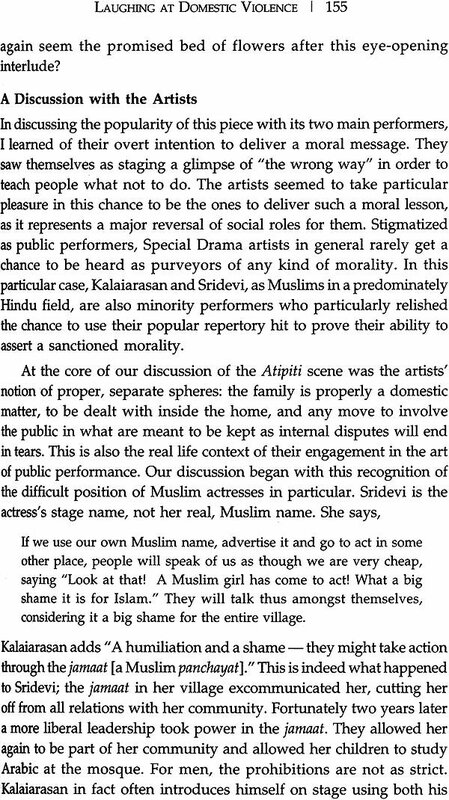 In a similar vein, it delves deep into the relationship among theatre, public/private sphere and gender. This work purports to address a variety of needs of feminist researchers and laymen who are not conversant with the contribution of women to theatre and its obvious political and transformative intent. This collection also intends to see how the theatrical space could unsettle the gendered binaries regulating women's presence in public space, and proposes to see why and how relevant feminist politics is in re-imagining a vibrant and inclusive concept of gender fairness and justice in contemporary India. It extends high referral value for researchers, students and even laymen with interest in the role of women in theatre. Anita Singh is Professor, Department of English and Co-Coordinator, Centre for Women's Studies and Development, Banaras Hindu University, Varanasi, India. Her areas of interests are Indian Feminist Theatre, Gender Studies and Performance Studies. She is both a critic and creative writer, and has published many articles, translations, book reviews, anthologies and short stories in various journals and magazines. Currently, she is working on a project sponsored by the Indian Council of Social Science Research, New Delhi, on "Staging Gender: Performing Women in Ramlila of Ramnagar". Tarun Tapas Mukherjee is Assistant Professor, Depart- ment of English, Bhatter College, Dantan. His research areas are Literary Criticism, Digital Technology for Literature, e-Literature and Cyber Culture. He is also the Editor of Rupkatha journal on Interdisciplinary Studies in Humanities. The performing space, whether it is the proscenium stage or a raised platform in a village or the fields or the street, lies silent and quiescent like a sleeping snake. Then come bodies, movements and words. And the stage acquires a character. It becomes entertaining, engaging, enthralling, maudlin, vulgar, crass and thought-provoking depending on who is occupying it. When women's bodies enter the stage they carry with them the words written on them. Women have to work with them, around them or discard them and create new words, new bodies. There are some extremely interesting essays, interviews and plays in this book which tell you how women revived characters marginalized in epics and rewrote the scripts of their lives, how women survived in traditional performing spaces, and how women and their contemporary lives and struggles for existence within the familial system and within fears, prejudices and pretensions of the society become haunting themes for playwrights. Life is full of drama. But often, caught in routine life, we miss it. The performing stage unfolds this drama before us in abstracted ways that make us revisit and relive living or reading moments we thought we had forgotten with a word here, a gesture there and a movement of the body which alters the space women occupy on the stage. The performing stage can also become a loud and melodramatic space with exaggerated and twisted presentations of popular entertaining plays that will not allow you to forget the limits and restrictions of not only the stage but of language and how it places women. Whatever character the performing space assumes, it is a space women must enter to succumb to it at times and to overcome it at other times and whenever possible, alter the space with subtle words and bodies or with bodies that grow as if in cosmic form to surprise and shake out of their slumber people who have forgotten what women's bodies are about. This book is about such possibilities of expansions and reductions of our bodies. Finally what we have is "the body with its immense possibilities and an empty performing space that it can occupy and give meaning to. And the drama of the female performing body and the performing space cavorting, fighting, falling and rising is the drama of life itself. Theatre, the imagined and enacted world of human beings, is one of the primary ways through which ideas, attitudes, beliefs and feelings of diverse people in different times throughout history are communicated. I recognize how the continuous act of performing identity makes meaning and it is the doing and making which reveals how realities are shaped both socially and theatrically. 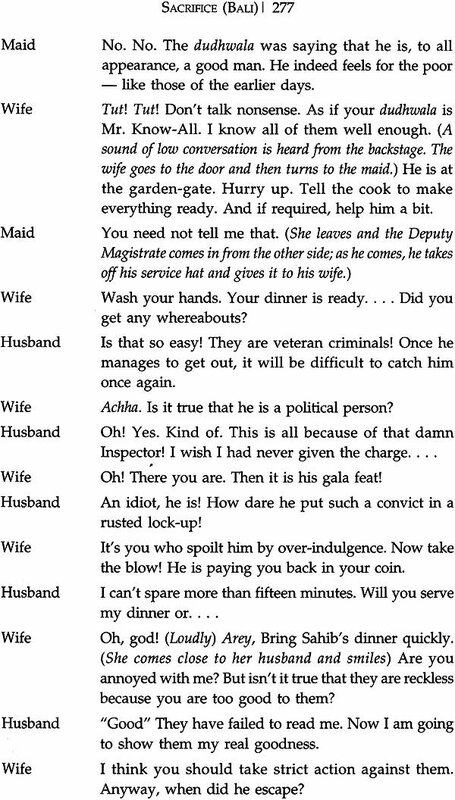 Taking cue from Butler's idea of drag as a mechanism that uncovers the falsity of the ontology of a "natural" gender identity, I also perceive its relation to certain Brechtian techniques which have been employed in feminist theatre to foreground gender construction. 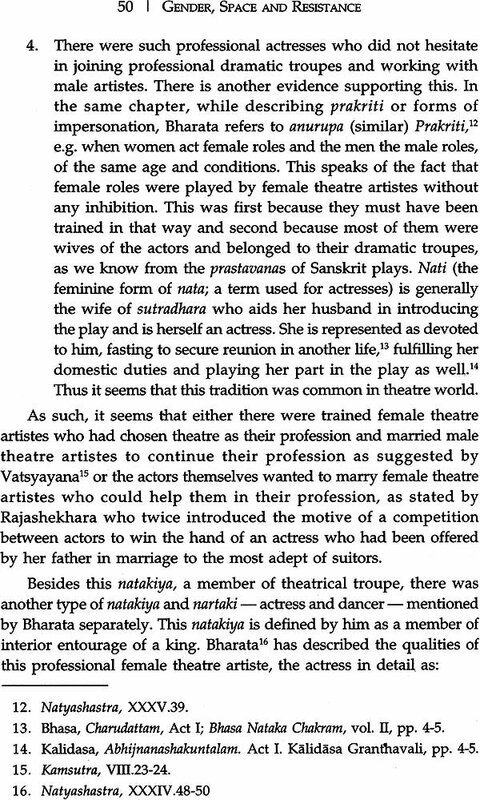 From Natyashastra to a one women-bare stage play performances by Mallika Sarabhai, Mita Vashisth or Saoli Mitra, this work argues that theatre and gender have commented upon each other's artificiality, providing spectators ways of seeing and restructuring the distinct cultural investments that are upheld in each. Almost like a rehearsal for social change, theatre authenticates the possibility of bringing about change in social reality. The book sets out to establish the historical association between theatre and gender along with the shifting cultural ramifications of this dynamic relationship from ancient times to the contemporary Scene and explores way in which certain plays, presented in specific theatrical styles, bolster us to think about and think against social conventions of gender. This book is an endeavour that seeks to explore women's presence in and their contribution to theatre in the recorded history and provides a platform to raise, discuss and debate issues connected With theatre - from aesthetics and techniques of the theatre to the Political, social and moral values for/of women involved in theatre from the study of the available material it is seen that the actual Contribution of women to theatre is marginalized in the otherwise comprehensive analysis of theatre. Thus an important component of women's cultural tradition is missing. 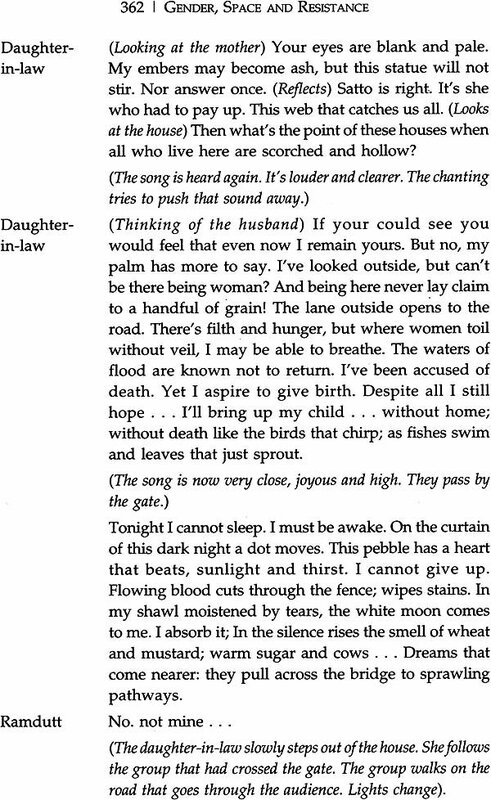 This book is, in the context of a cultural critique of patriarchy, to "fill in the blanks" where women have been hitherto "hidden" in theatre histories. First the volume aims to address - with a view to the increasing interest in women/ studies in the academia - the lack of scholarly materials in the market about the presence and participation of women in Indian theatre. 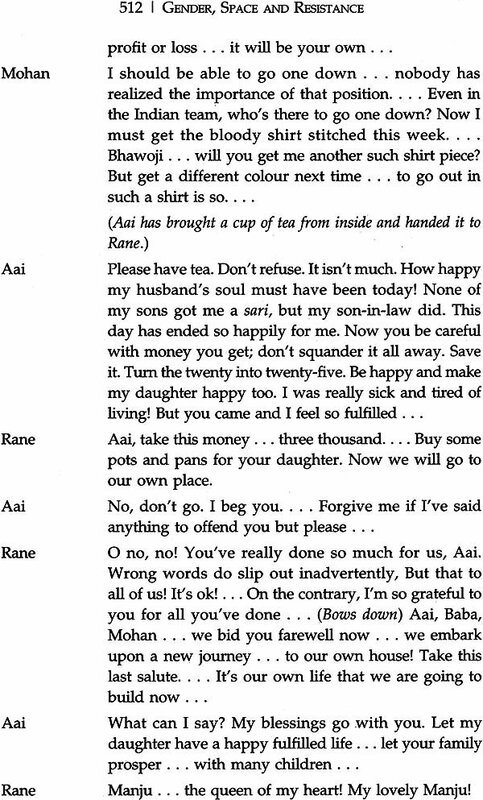 Second, the volume would try to unearth and explore the dynamics of gender in the history of Indian theatre. The introduction forges links between gender and theatre and, in the process, offers a brief history of feminist theatre. 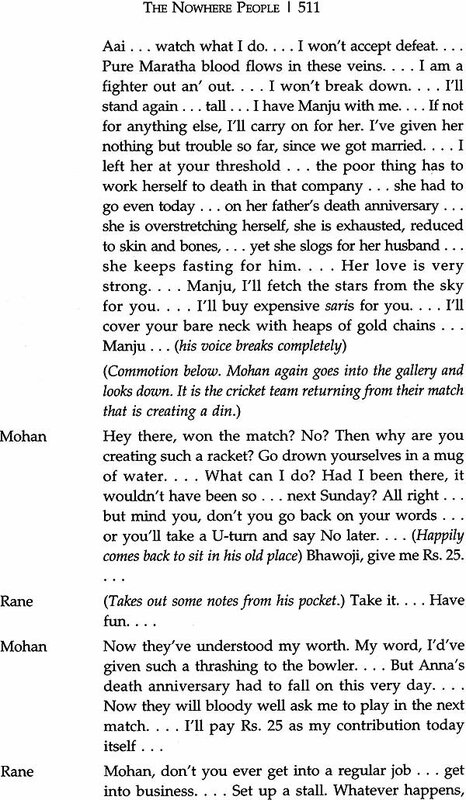 Play texts by Tripti Mitra, Tripurari Sharma, Kamalini Mehta, Mallika Sarabhai, V. Padma "Mangai" and K.V. 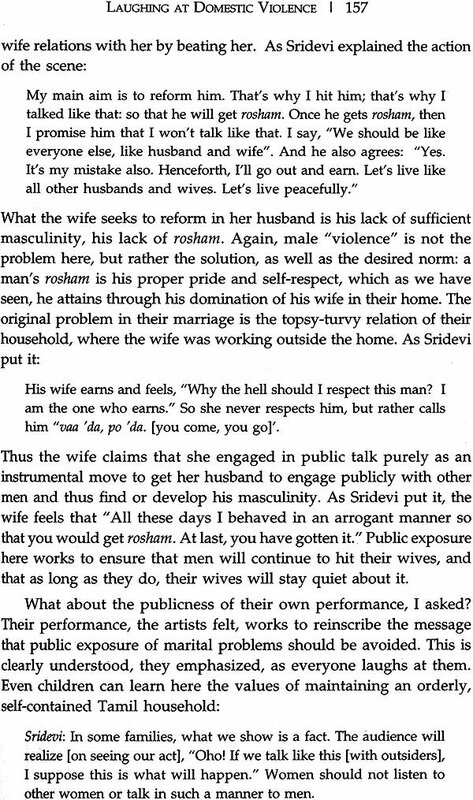 Sreeja question the male-power relations and explore strategies to develop an effective model of female agency. Third, it will deal with the theoretical aspects of Indian theatre. Finally, two play texts by Sanjay Pawar and Jayant Pawar deal with complex cultural scene in the contemporary urban spaces and engage with the issues of caste and gender inequality in a so-called "modem" society that claims to be progressive and developed. 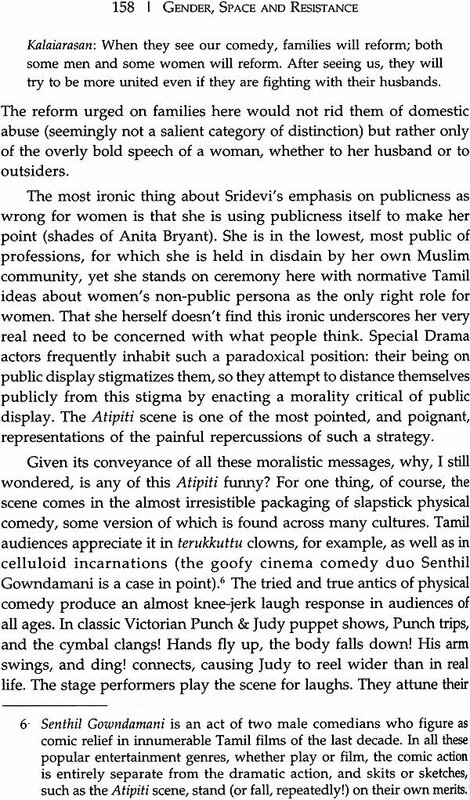 The "interviews" section draws together the voices of women currently working in Indian theatres; it rakes up many questions. What does feminism mean? Do gender issues matter in the theatre? Is there a "female", "feminine" or "feminist" way of working in the theatre? Are things changing for women in the Indian theatre today? It records these women's voice as they articulate from individual positions with regard to age, class, caste, sexuality and regional identity, and approaches to theatre/performance. The three sections of the book - critical essays, the play texts and the interviews - all in some ways would address the social issues associated with gender inequity. They propose to see just why and how relevant a feminist politics is to re-imagining a vibrant and inclusive concept of gender fairness and justice in contemporary India and thereby constitute a significant intervention of gender in the discourse of Indian theatre. This volume then one could say unites these strands of examining ways that females perform/write and at the same time it also questions how rewarding is the stage space for such interrogation. This book was born out of my long association with theatre. All books have their own history of making, of sharing, and of doing, and this book is no exception. First, let me give thanks to Almighty God, who has given me the strength and resolve to be what I am today. To God be glory, great things s/he has done. This work bears the imprint of many people. I would like to thank my family for their support _ my parents who always believed, as all parents do, that the best would come my way, my sisters for their friendship, advice and inspiration, and two nephews, Rahul and Vikram. I express my gratitude to C.S. Lakshmi (director, Sound & picture Archives for Research on Women (SPARROW), Mumbai) for consenting to write the "Foreword" for this book. This work is a collective effort of my gracious contributors Mallika Sarabhai, Tripurari Sharma, V. Padma "Mangai", Saoli Mitra, Poile Sengupta, Claudia Orenstein, Maya Pandit, Richa Nagar, Susan Seizer, Shayoni Mitra, Nishat Haider, Banibrata Mahanta and others. It could not have been possible but for the unwavering support of my students Shyam Babu, Rahul Chaturvedi, Nirban Manna, Hariom Singh, Ashutosh Singh, Shreyasee Dutta, Supriya, Praggnaparomita, Priya, Richa. Arpita Ghatak, Maneesh Rai and Amar Singh, who all in their own ways knowingly or unknowingly helped to create a passageway for this work. I appreciate the unquestioning faith of Shri Susheel Mittal for being ready to publish this work, when all others were in doubt as the structure and nature of this book refused to fit in the neat shelf of an English literature department. The support and care of Ashok, my husband, and children have always nourished me. This book is for my children, Alankrita and Amitabh, for being wonderful, amazing and supportive and for always spurring me on to do more and a little more. 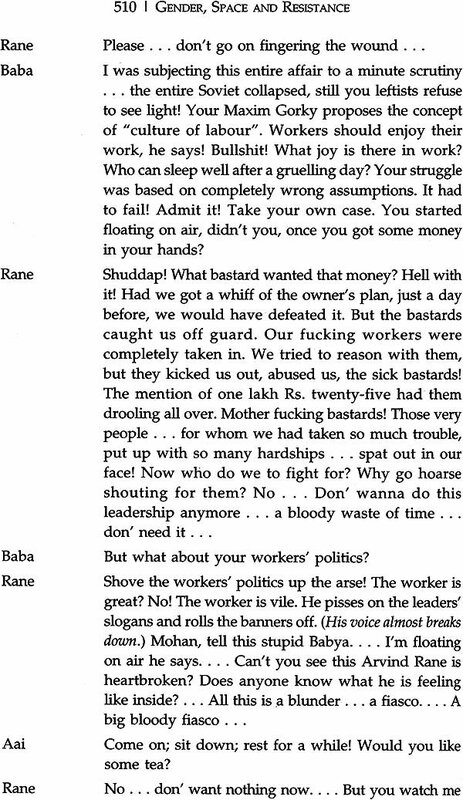 Poile Sengupta's interview reprinted in this anthology was first published in Asian Theatre Journal, vol. 29 no. 1 (Spring 2012), University of Hawai'i Press. I here also acknowledge the award of a research grant by the Indian Council of Social Science Research for my project on "Staging Gender: Performing Women in Ramlila of Ramnagar " for which this anthology is a timely prelude. Once upon a time: Where does Alice fit? 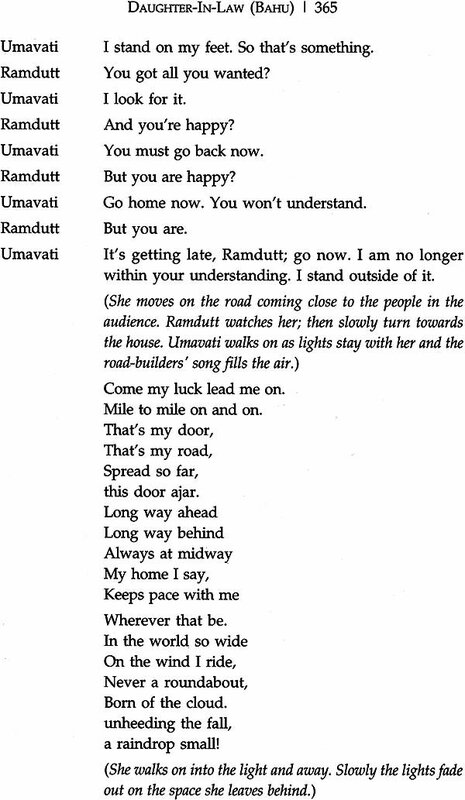 To begin, let me mythologize women's presence in theatre. Our tale opens, as all myths must, with a flashback to the early contribution of women in theatre, setting up Alice as our mythological child with special abilities. 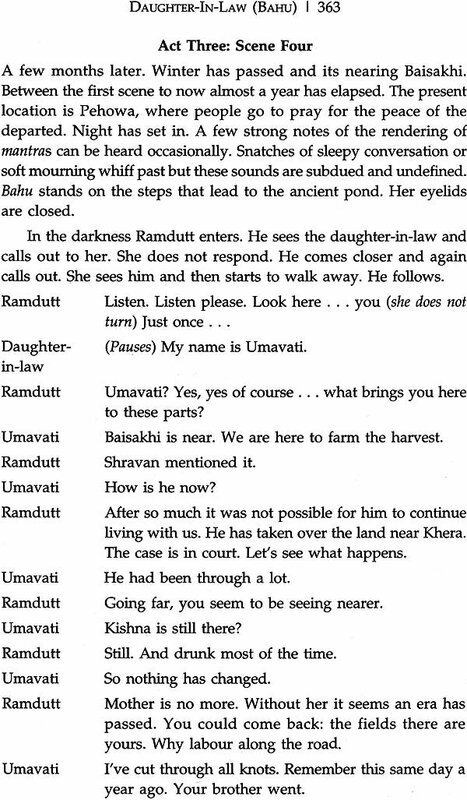 As it often happens in such stories, the hero finds her way. At first, the world she is in pushes her along an ordinary path. She has been growing and shrinking throughout the story, symbolic of the changes she's going through. But Alice does not fit; she is different. "Why" is it?" when she is asked wistfully, "you are always too small or too tall?" Her sence of self goads her into finding her "muchness" quest is always about self-discovery, it is underlined with an anger, a spirited anger to change the entire shape of things, not only saving the world. Theatre is a public institution, a theatre performance a public event. On stage the theatre makers offer vision on the cultural and social conditions of a society and negotiate, so to say, with the audience (altering) norms and values of the society. Therefore a theatre performance is both an aesthetic, artistic phenomenon and a social and political event. 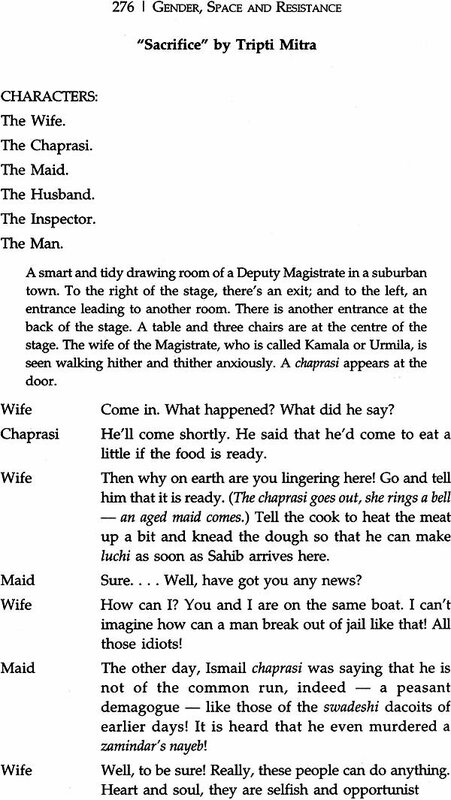 Theatre in India has a long tradition. Women have performed roles that have ranged from writing plays to direction and acting, to criticism, research and organization, there is extensive material to show the presence of women in all these areas. This anthology ventures to explore women's presence in and their contribution to theatre in the recorded history and provide a platform to raise, discuss and debate issues connected with theatre - from aesthetics and techniques of the theatre to the political, social and moral values of women involved in theatre. From the study of the available material it is seen that the actual contribution of women to theatre is marginalized in the otherwise comprehensive analysis of the theatre. Thus an important component of women's cultural tradition is missing. 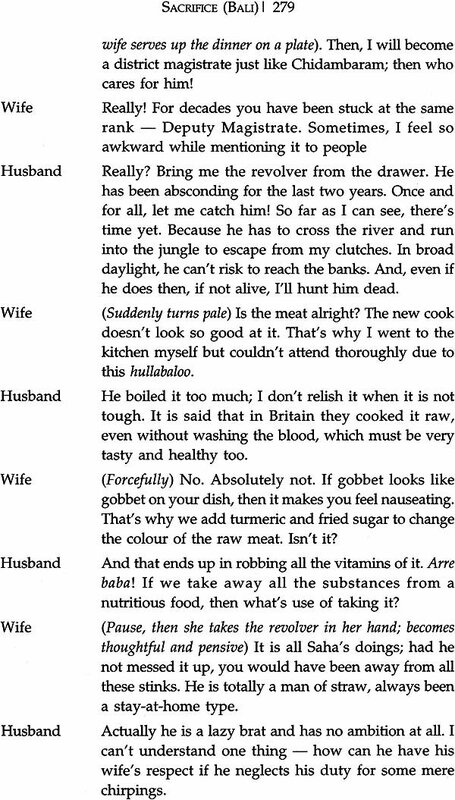 This book is simply to "fill in the blanks" where women have been hitherto "hidden" in theatre histories. 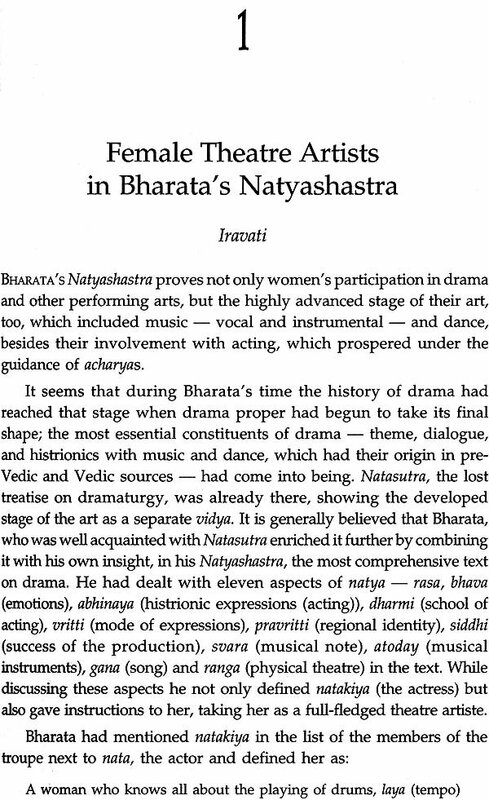 First of all, this volume aims to address - with a view to the increasing interests in women/studies in the academia - the lack of scholarly material in the market about the presence and participation of women in Indian theatre. 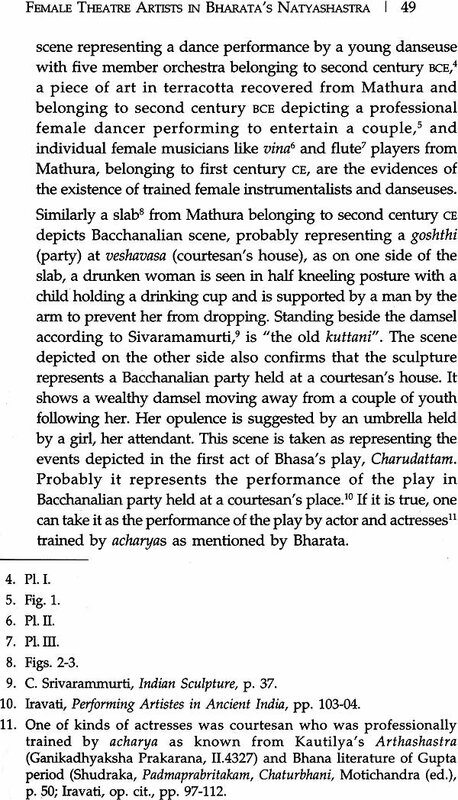 Secondly, the volume would try to unearth and look at the dynamics of gender in the history of Indian theatre. Thirdly, it will deal with the theoretical aspects of Indian women's theatre. 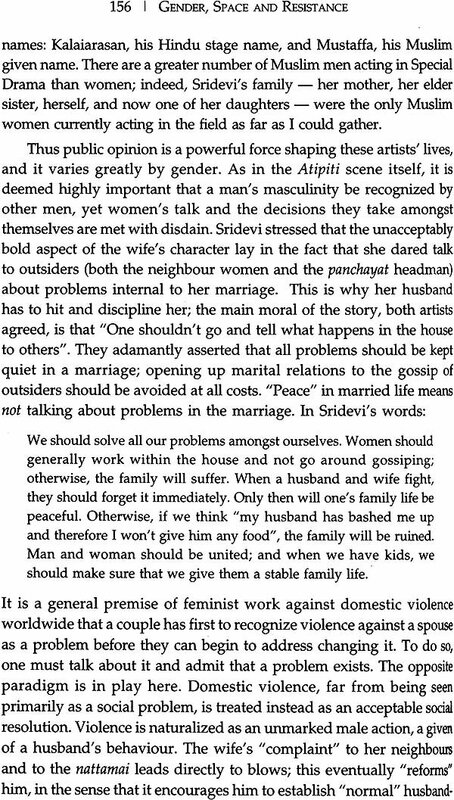 The critical essays, the play-texts and the interviews, all in some ways would address the social issues associated with gender inequity. In a similar vein, it also intends to look into the linkages between theatre, public/private sphere and gender. 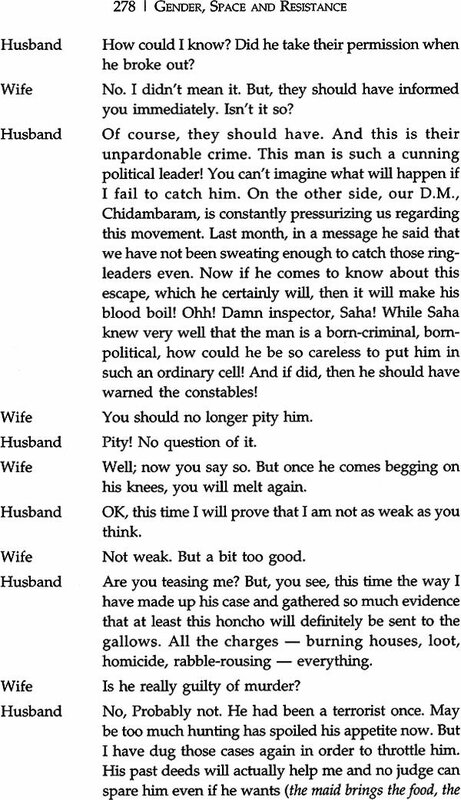 The texts that find space here are attentive to the invisibility of women from stage as a public forum, either directly as an actress, a writer or a director or indirectly in roles where they cannot escape their traditional representation and further discuss and question the male power relations and explore strategies to develop an effective model of female agency. Performativity and performance are thus beth social and artistic concepts that function in theatre and drama. They have been central in the arrangement of themes and issues in this book. Between the bounds of one book, this work purports to address a variety of needs of feminist researchers and laymen who are not conversant with the dynamic creativity of women's contribution to theatre and its obvious political and transformative intent. It also sets out to establish that the ideological positions of the society and of the playwright shape the contours of the theatrical space [and that] the analysis of theatrical space directly reveals the changing conceptions of woman's position in the family and society. 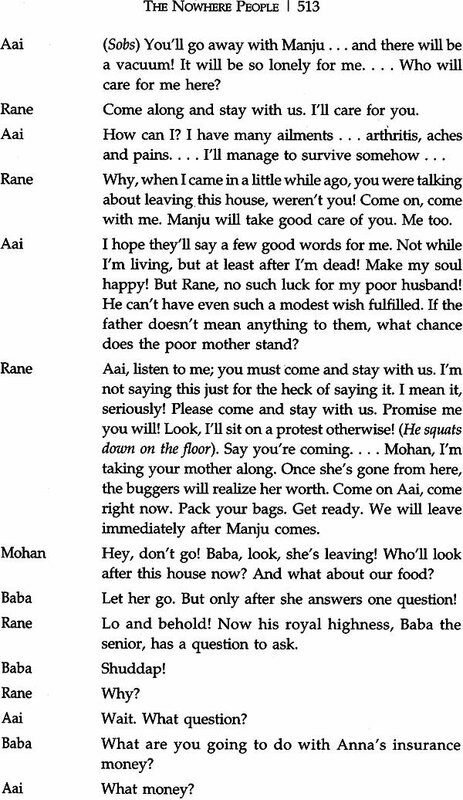 It's clear that there is lack of proper source and study materials on women's participation and presence in Indian theatre as an area of reading and research. Theatre scholarship in India is only just beginning to respond to the insights and emphases suggested by feminist criticism and feminist activism. Although this is by no means a comprehensive catalogue, I list here some anthologies, books, journals and research papers in relation to gender and theatre: classical performance has claimed attention in Iravati's Performing Artistes in Ancient India (2003), this deals at length with aspects of dramatic performance like nature, kinds and members of dramatic troupes, abhinaya, the stage and auditorium. It also significantly incorporates details of actresses like professional actresses, courtesan actresses, divine actresses and so on. 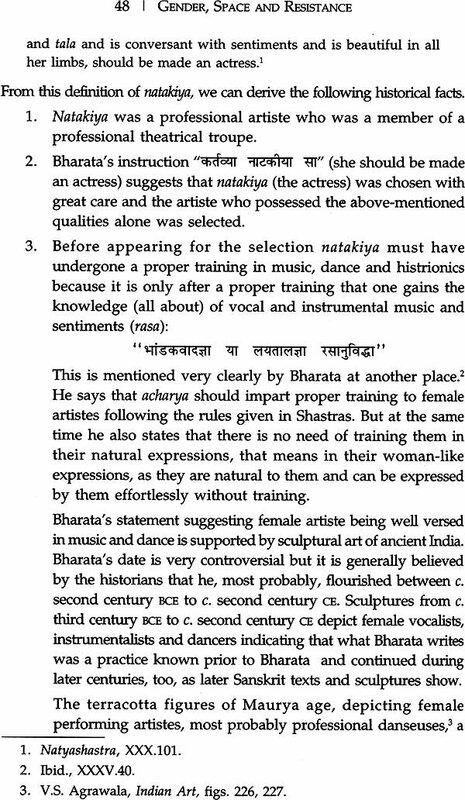 It refers to Natyasastra1 and other noted works on dramaturgy and their authors. Apart from this there are a number of works which address the performance tradition of Ramlila Kudiyattam, nautanki among others. 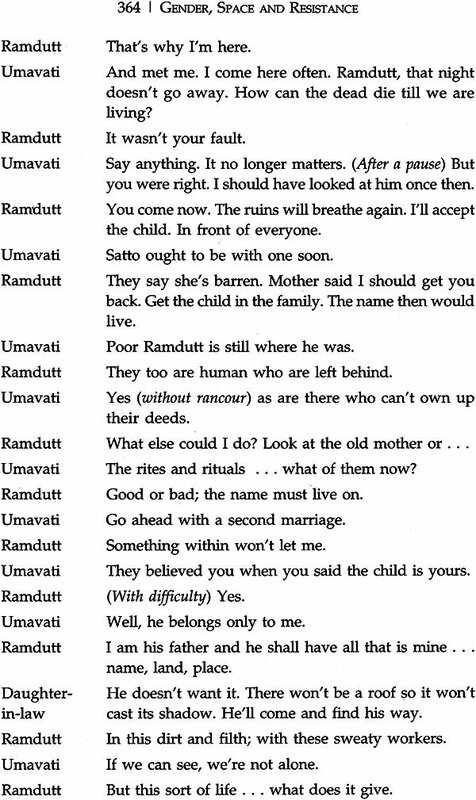 Nita Kumar tackles Ramlila for class and gender politics.